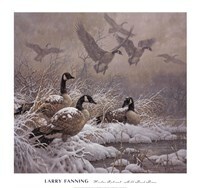 Larry Fanning is a self-taught Western and wildlife artist who was born and raised in Kansas. After working as an illustrator for the Boeing Company, he pursued a career in commercial art and graphic design before moving to California. Once there, he set his art aside while serving as a nondenominational minister for 17 years. Shortly before moving to Colorado in 1986, Fanning resumed his career in art. Energized by the mountains and the changing seasons, his love for the West shines through his vivid paintings. He says, "In its richly endowed land, its wildlife, and in the dreams of its people, there pulses an energy that is sacred and life-giving." Collector demand soon outpaced his supply of paintings. Fanning's art can now be found in private collections throughout the U.S., Canada, Europe and South America. He is an artist who preserves the constantly forming ideas, moods and emotions that later emerge in his sought-after paintings. He always takes a camera and sketch pad with him when he travels. "Very often, an artist will see parts of a painting, such as the light on a tree," he explains. "You retain it along with a number of other elements. When the catalyst for a painting happens, you then draw upon that well of stored images." Fanning has a natural understanding of anatomy and an instinct for color. Much like an actor, who strives to make a scene come alive for an audience, Fanning endeavors to put himself into the setting he is painting. 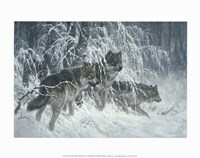 He tries to experience the crunch of the snow, or the howl of the wind so that the viewer will also feel drawn into the painting and can participate in its story. 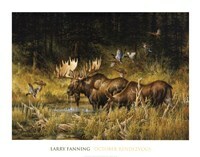 Fanning's appreciation for life's unending splendor is richly reflected in his art.